Her comments followed the ousting of President Omar al-Bashir, announced on State television on Thursday, accompanied by the declaration from the defence minister, that a military council would govern the country for up to two years. He said the military council was committed to respecting all international agreements, and “a peaceful transition”, in which it would be the “guarantor” of a return to “civilian government”. Sudan’s Deputy Ambassador, Yasir Abdullah Abdelsalam, addresses a Security Council meeting on Sudan and South Sudan on 12 April 2019. “No party will be excluded” from the future electoral process, he added, including armed groups. He told Council member the suspension of the constitution “could be lifted at any point” and the transitional period back to civilian rule “could be shortened, depending on developments on the ground and agreements reached between stakeholders”. “Any democratic process requires time and that should not be threatened. We do not wish to see the nascent gradual democratic process unravel in the name of democracy”, he said. “This is a very critical, volatile moment for Sudan and there is deep uncertainty and unease about the future,” High Commissioner Bachelet said in a statement, delivered in Geneva by Ravina Shamdasani, from the Office of the High Commissioner for Human Rights (OHCHR). 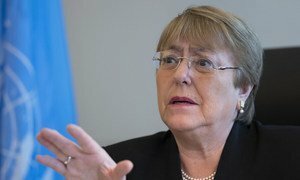 UN Human Rights Chief @mbachelet urges #Sudan authorities to protect human rights and rule of law. The crisis has its roots in #HumanRights grievances – economic, social, civil & political rights. The solution must also be grounded in human rights. In an update to journalists, Ms. Shamdasani said that it was “encouraging that there was no violence overnight” in the capital Khartoum – “even though the curfew that had been imposed was not respected by peaceful protesters”. The OHCHR official also noted unconfirmed reports that some political detainees had been released, before urging the authorities to release all political prisoners. However, amid uncertainty about how the crisis might play out, Ms. Shamdasani noted that the demonstrators might be unwilling to accept the military council’s declaration. 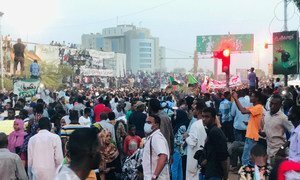 Reiterating the High Commissioner’s comments, Ms. Shadasani noted that the protests against President Bashir stemmed from widespread human rights grievances: economic, social, civil and political. Asked whether former president Bashir should stand trial on charges of war crimes and crimes against humanity including genocide linked to violence in Darfur - issued by the International Criminal Court in 2009 and 2010 - Ms. Shamdasani said: “We would encourage the Government of Sudan to fully cooperate with the International Criminal Court”. “We are also calling for full accountability, including for the use of excessive force that has taken place since December this year”.